The DYNTRA collaborative platform, which works on the measurement and management of open government in organizations and public administrations, evaluates the transparency of 74 Spanish universities. The University of Cádiz currently occupies the fifth national position and the first position among the Andalusian Universities. 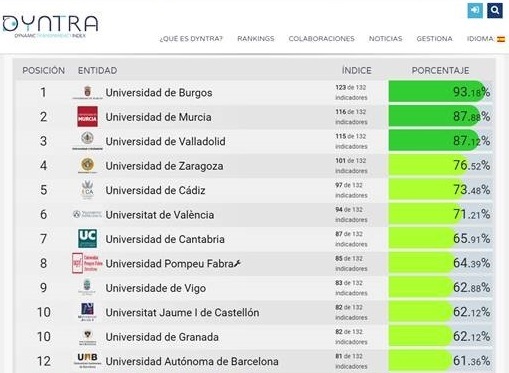 It is a demanding dynamic ranking that evaluates the information published by the institutions, both public and private, in which the UCA complies, today, with 97 of the 132 possible indicators. In the area of ​​public administrations in the province of Cádiz, the UCA also leads this ranking with a transparency index of 73.48%, followed by the Provincial Council (66.49%) and the City Councils of Cádiz (54, 72%), Jerez (51.57%) and Algeciras (47.17%). The UCA, through its transparency improvement group, works every day to continue improving and achieving the maximum transparency of the institution, accessible through: http://transparencia.uca.es/.